Some kind of evil cat left over from Survival? "She's about to die Dok-tor!" "He doesn't make many mistakes. He seems to understand when patients are about to die," David Dosa, a professor at Brown University who carried out the research, told the Associated Press news agency. 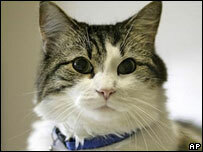 Oscar was adopted as a kitten at Steere House Nursing and Rehabilitation Centre. The cat is said to do his own rounds, just like the doctors and nurses at the home, but is not generally friendly to patients. Although most families are grateful for the warning Oscar seems to provide, some relatives ask that the pet be taken away while they say their last goodbyes to their loved ones. When put outside the room, Oscar is said to pace up and down meowing in protest. Thomas Graves, a feline expert from the University of Illinois, told the BBC: "Cats often can sense when their owners are sick or when another animal is sick. "They can sense when the weather will change, they're famous for being sensitive to premonitions of earthquakes." A doctor who treats patients at the home said she believed there was probably a biochemical explanation, rather than the cat being psychic. There's a scene in the film 'Go' I believe, where one of the characters, stoned out of their mind, is psychically told by a cat that he is going to die. He survives, so the cat was wrong. It's a side of cats that you don't find out about until you have one- they're very good at knowing when their people need a bit of comfort. Knowing cats better than you, they're scavengers and she's probably going, "just a few more minutes and I can feed". Best - Thread - Title - Ever! Last edited by Dave Tudor; 26th Jul 2007 at 11:00 PM. Cool - I've also sired another thread which has been accused of being the Worst Title Ever - so I've both awards in the bag!